Home Q&A	Let’s start the new year with a Q&A! Ask me anything in the comment field below – I will answer some of the questions in a video, and the rest as a regular blog post. This will be fun! Keep in mind that I’m not a horse trainer, if you need training advice or help to solve a problem, please seek professional guidance! I recommend www.pluvinel.com to find an instructor in your area. what is the best memorie you and Batmas have ever had togheter? What’s the worst thing Batman has Done to you? What is your hope and goals for 2017? How many saddles do you own and what kinds are they? How often do you see Batman? Hello! You have a stunning horse! I have a Gypsy horse gelding and he has had problems with his legs. I saw on your instagram that Batman also has had (or still have I’m not sure) problems with his hind legs. What caused his leg-problems and how has it affected Batman? I also wonder, is Batman afraid of something in particular? Hvilket bittløst (som ikke er halsring) alternativ er favoritten din? Hvordan går det med dere for tiden? I also love the pictures you make together. And the dresses or skirts you wear. I really want to own or make a riding skirt or riding dress my own, so: how does the model of the skirt look like? How does it fit you so well on top of a horse? Is there a split in the front? Or do you have a pattern? I couldn’t find any patterns of a riding skirt. And a completely different question! Why does Batman have his name? Traditionally, Friesian horses have Friesian names, like ‘Tjillerd’ or, for mares, ‘Baukje’. ‘Batman’ is an English name, of course. What do you like the most to do with batman? Did you thought you ever get this big? What do you like the most about batman? Was batman already calles batman when you got him or did you name him? Are friesians also your favorite breed? I’ve been trying to figure out what I want to do for a career but I want to continue to work with horses so my question is how do u afford your horse habit and a Fresian as well? I have a lot of questions haha. How did you found Batman? Do you have baby foal pics of him? And what do you love the most about Batman? Would you like to visit other countries? If so, which ones? What do you hate the most about people? What do you love the most about people? Would you please be so super kind to take a look at my page and take a look at my gorgeous care horse Apassionata? She’s an extremly adorable mare with a huge unique mark on her face haha! Last one : What would you like to achieve this year? if you can have another horse which breed would it be? Hello!! So I have a question :)! •do you use any apps or whatever on your computer to edit your photos?? Your horse is beautiful and so are you! I love you and your horse and the connection you have with him, that’s so beautiful to see ! I had two questions for you : In wich country do you live ? And have you find Batman in this country or in another one ? How did you learn about Academic Art of Riding? Did you start Batman in this technique alone? If you could give one piece of advice for someone starting a young horse in the AAR technique what would it be? Would you ever come to Canada? Er det noen hester du gjerne ville ridd (f.eks. Noen fra instragram)? Hvilke personer skulle du gjerne møtt? Hvilke tre hesteraser er dine favoritter? Har du noen mål for 2017? Hva syns du om Charlotte Dujardin og Valegro? I would like to know where do you find all of your dresses and medieval stuff and tacks ? Where do you get your cordeos? Is Batman easy trained with tricks and such? 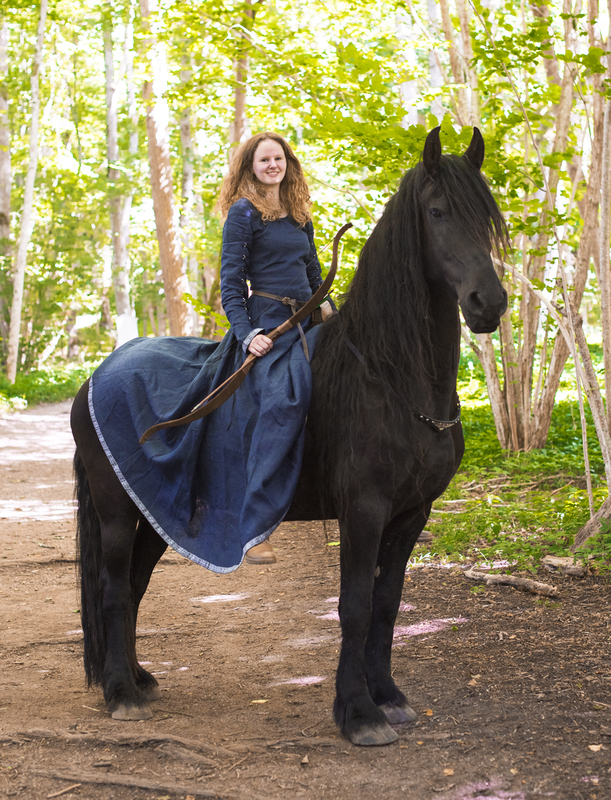 Where did you get your face shield you have on your Friesian in some photo shoots? Which saddle do you and Batman prefer for longer rides? How would you recommend to go forward when taking off the shoes of your horse? Does Ronja who made your cordeos take requests on cordeos from others or is it only for you she does it for? Does Batman have a best friend? What sort of bow do you use? Have you ever been concerned about (accidentally of course) hurting the horse with sharp arrows? For the purpose of getting us used to archery it’s ok, while in the long run I would like to advance equiptment-wise. But the hole “sharp object on the horse” issue worries me a great deal, what if I accidentally poke him with an arrwohead ? For how long did you practice on the ground (with sharp arrows) before mounting Batman? And just for fun: Do you sometimes imagine that you and Batman are hunters/indians/warriors from the olden days when you’re doing mounted archery?